Curated by the wellness experts at HoMedics, Ellia essential oils are a premium line of therapeutic-grade essential oils that are designed to reduce stress, boost mental clarity, and soothe your body and mind. Our essential oils are sourced from all over the world after a meticulous process of careful and conscientious research to identify the best regions for each aroma. We work with a global network of farmers who harvest our plants at their peak to collect their natural essential oils. The plants are either cold-pressed or steam-distilled to their very essence before undergoing rigorous testing – all so you can experience their natural effects and benefits. The familiar scent of Lemongrass is a staple in almost every essential oil collection. It’s sweet, lemony, and purifying — perfect for cleansing any room to create a fresher smelling atmosphere. Diffuse it while you study or work out, or whenever you need a boost. Its citrus scent is uplifting and clarifying, helping you to clear your mind and relax. It’s refreshing scent helps to promote deep breathing, making this scent great for when you practice yoga or meditation. When you diffuse this lemony aroma into the air, you promote a cleaner, more comfortable environment. All it takes is 5-7 drops and your humidifying diffuser will start to fill your home with the refreshing, citrus scent of lemongrass. This essential oil is the perfect finishing touch to any room – leaving behind the effect of lasting freshness. Combine this multi-use essential oil with your favorite Ellia carrier oil to use topically. Rub it into your skin and pulse points to inhale and benefit from its cleansing, uplifting effects. Pulse Points on your body can include the neck, wrist, behind the knee, ankle, temples, and soles of feet. 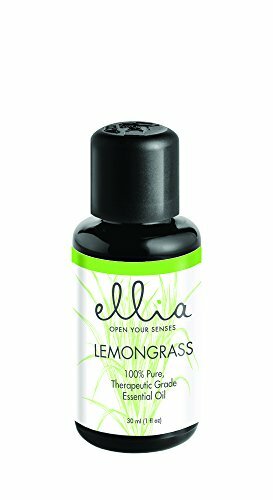 Our Lemongrass essential oil blend is bottled exclusively in the USA. To protect its qualities, it’s sealed in dark violet glass. Each bottle includes a child-proof cap for extra protection.